Are you willing to help a senior with a ride to their medical appointment or assist them with a trip to the grocery store? Please come and join us. Community Partners in Caring (CPC) will be having three informational sessions at Shepard Hall on Tuesday, November 13, 2018, at 11:30 am, 12:15 pm, and 1 pm. These sessions will be held at 421 S. McClelland St., Santa Maria, CA 93454. CPC will be teaching our community about the risks that our senior population face regarding social isolation and what we, as a community, can do to help. 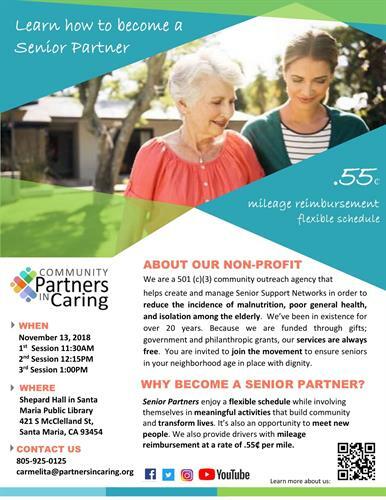 You will learn about what services we can provide, the areas we serve (Santa Maria, Lompoc, and Santa Ynez), along with the benefits included when signing up as a Senior Partner. Feel free to invite a friend, family member, co-worker, neighbor, church member, or anyone else that might be interested. Refreshments will be provided.